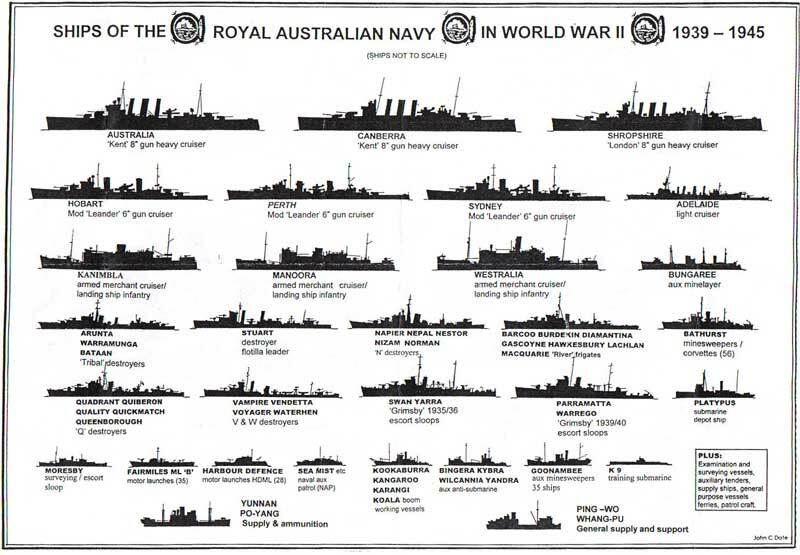 The accompanying diagram depicts the Ships of the RAN in WW2, for a meagre populated country at that time it was a remarkable achievement, over 200 vessels in all, which included 56 Bathurst Class Corvettes / Minesweepers all built around Australia and named after the country towns found in each State of the Commonwealth. They carried names like Toowoomba, Woolongong, Geelong, Burnie, Wyalla and Kalgoolie. 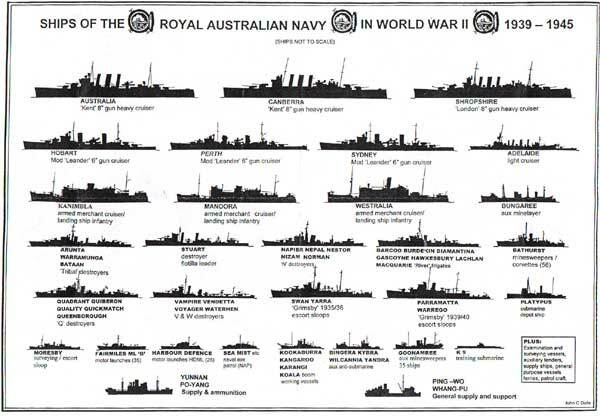 From the seven Cruisers that saw the start of this conflict, Canberra, Sydney and Perth were all sunk. Australia collected 6 Kamikaze aircraft on board, one at Leyte in October 1944 at the invasion of the Philippines, and another 5 at the Lingayen landings in Northern Luzon in January 1945, she survived to sail to England for repairs. Hobart collected a Japanese torpedo, but saw out the war. I saw wartime service in all three 8 inch gun heavy cruisers. I am indebted to John Date for this drawing. Click here to larger picture (800x555 pixels 64K bytes). Click here to larger picture (1000x693 pixels 93K bytes).